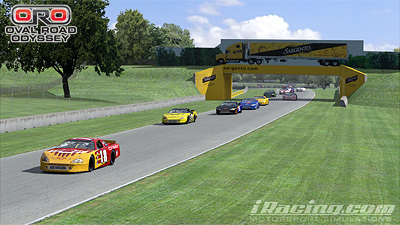 ORO racers compete at Road America for their season two event. I haven’t posted about Oval Road Odyssey (‘ORO’) before on this blog, but a recent race at Road America is a good time to talk about this excellent league. 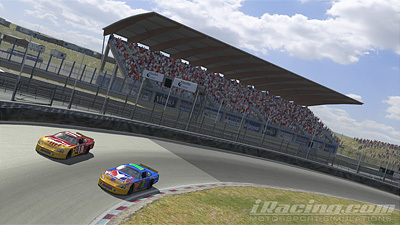 The Oval Road Odyssey is an interesting weekly racing league that seeks to take the Chevrolet Late Model to a range of road tracks in iRacing and let the motor run loose in (usually) 30 minute race events. The late model is primarily an oval car in iRacing, but it also serves as a really great road racing car and is a lot of fun to race. 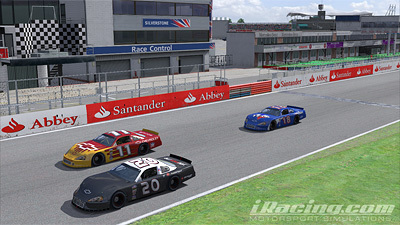 I first had a taste of road racing the late model back in 2009 when iRacing ran a fun event at VIR, and I blogged about that back then (here). The ORO started up last season and currently is working its way through season 2. The website for ORO is www.oval-road-odyssey.com. All comers are free to join in. This weeks race took us to Road America in a lengthened 60 minute race with a mandatory pit stop. I didn’t have great pace and qualified 9th of 25 so I decided to run an extreme pit strategy and come in for my stop at the first possible opportunity. My hope was that it would put me in clear air for the first half of the race where I could lap at maximum pace without getting caught up in any battles or spins in the pack. It worked pretty well – I had to put in a few laps before my pit window opened up (the late model fuel tank would only do around 21 of the 24 race laps in one fill) and generally my opening laps were good. I picked up a few spots and avoided all the early carnage, in spite of some (very) close calls! I climbed to 5th before diving into the pits on lap 4. I left the pits in 15th and whilst I didn’t have a perfectly clear track, I was able to dispatch a few of the slower cars and generally make good progress. A great moment happened on lap 14 as car #22 took his pit and left the pits precisely as I was barreling down the pit straight. It was extremely tight and close racing as we both entered turn one side by side, driving by inches! We had a little battle for a while before #22 spun out during a passing attempt and retired. The final stages of the race saw some more action as I gained a couple of spots by virtue of a spinner and finally an unlucky entrant running out of fuel on the last lap! End result was a fourth place which was great considering the starting position! I race in ORO each week and I’ll post more about it when appropriate.